The All New, All Daring Delusional Honesty! : Storm Warning 5: All the Firestorm That Will Stick! Storm Warning 5: All the Firestorm That Will Stick! Yes, I've been away...again! But now I'm back to tackle the fifth in a series of posts chronicling my enjoyment of the adventures of everyone's favorite Nuclear Man (because, you know, that guy Luthor cloned from Kal-El's hair for Superman IV: The Quest For Peace didn't really cut it). This outing, we'll take a look at everything that's happened to Ron Raymond and Martin Stein in the years since their 100-issue series The Fury of Firestorm ceased publication up through that point where they decided they'd done just about everything with him they could possibly think to do. Y'know--all the poop that'll stick. Onward? Onward! At long last--Firestorm returns. Cover art to Extreme Justice #5 by Marc Campos. After DC canceled Firestorm in mid-1990, the character floundered, more than likely because after the radical changes John Ostrander had effected, no one quite knew what to make of him. Was he a nuclear-powered hero, or an elemental force? Was he comprised of two men, just one, or many? Love it or hate it, what we now refer to as the "Firestorm Matrix" is at the center of the debate over the character to this day, and in some ways, opening up Firestorm to being people other than Ron Raymond and Martin Stein was the worst thing that could happen, a dark stain on the character that divided the fanbase. And yet, just as it adds divisiveness, the Matrix also provides a broadening of the character's scope to allow for various types of stories, the like of which Ostrander only hinted at during his tenure. Hence, it's somewhat embarrassing to see that not only did it take some time in returning Firestorm to print (a few token appearances in the summer crossover War of the Gods and the conclusion of Shadowstorm's story in Captain Atom #54-57 notwithstanding), when he finally returned DC took pains to eliminate the dual personality aspect that had driven the character through his most successful incarnation of the Gerry Conway period. In the series Extreme Justice, a Justice League of America spin-off, writer Dan Vado and artists Marc Campos and Mozart Couto chose to again bestow Nuclear Man status upon Ron Raymond. They revealed in the #0 issue that Ron had developed some form of leukemia and it had the strange side-effect of making him burst into nuclear fire above the city of Pittsburgh. The Extreme Justice team arrived to try to help, followed by Martin Stein as the elemental version of Firestorm. Having lost touch with his emotions, Martin intended to re-merge with Ron, absorbing his memories and consciousness into his own so that he could again look at the universe with a sense of wonder. Of course, Ron declined, but Martin chose to cure him of his leukemia, allowing him to remain Firestorm and serve alongside Captain Atom, Blue Beetle and the other team members. 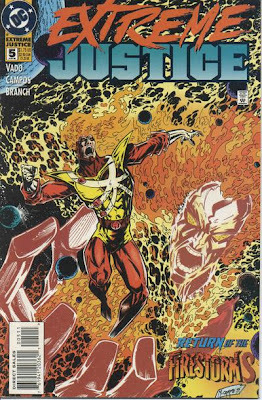 I remember picking up issues four and five of the series, wherein most of the Firestorm-related action occurred, but I hastily dropped the book soon afterward because it truly wasn't the version of the character I wanted to read. Oh, sure, I bought one more issue of the series--number eight--that reinforced my opinion that whoever DC thought Firestorm was, he wasn't my hero anymore. They made him an underwear model--nicknamed "Ron Ray"--and they made him an active, then recovering, alcoholic. That chain of events--that led him to getting kicked off the Extreme Justice team right around the time the book itself got canned--culminated in a nauseating, totally uncharacteristic two-part "solo adventure" by Robert L. Washington III and Randy DuBurke in Showcase '96 #6-7 that had Ron entering rehab and featured precious little to remind me of who Ron and Firestorm ever used to be. Then and now, I honestly don't know what DC was thinking in changing the character so drastically, probably in a knee-jerk reaction to what was happening to the rest of their heroes during the decade. Superman died, someone broke the Batman, Green Lantern destroyed the Corps, and oh yeah, Firestorm turned into a raging alcoholic! So after a fashion, they turned the Nuclear Man into a cheap knockoff of Michael J. Fox in "Bright Lights, Big City." They darkened him up. Was that the best they could do? Firestorm teams with yet another character to help him use his powers. Thankfully, Firestorm's "dark" period passed, and DC started using him in their crossover events such as DC One Million and The Final Night. In James Robinson's Starman #38, he bore witness to the deaths of virtually all of the Justice League's European branch. Despite his having been around the DC Universe for many years by this point, he was continually played as the "noob," the guy who is standing around in the shadow of the big boys but who doesn't really know what the hell he's doing. Really, when you think about it, it was half an insult due to his tenure (and the fact he'd quickly been snatched up by the Justice League so soon after his introduction), but also half-truthful, for Ron Raymond was no longer operating in conjunction with Martin Stein, whose smarts allowed Firestorm access to the full complement of his powers, chiefly his atomic restructuring abilities which relied on advanced knowledge of chemistry. Hence, in the absence of a "Firestorm Matrix," DC's solution was simple: partner the hero with another one who can fill the Martin Stein role, but not be an actual part of Firestorm. Essentially, they wanted to dilute the concept and turn Firestorm into the guy who needs a sidekick because he can't use his powers well enough by himself. Does that sound stupid? I thought so. Why was DC so evasive about using the "Firestorm Matrix"? Did they truly associate everything John Ostrander did in exploring the Matrix with why the book had been canceled years before? Or did they believe the existence of the Matrix made the book too cerebral? More likely, they believed--perhaps rightly--that the Firestorm character could never be popular enough to again be a solo feature, so instead they attempted to couple one not-quite-popular-enough-to-carry-his-own-book hero with another not-quite-popular-enough-to-carry-his-own-book hero, in hopes their combined popularity could lead to a limited or even a full-time team-up series. I think it was Geoff Johns who first explored the idea of teaming him with Ray Palmer, the Atom, and it's really an inspired choice beyond the fact that he's named after something that Firestorm is able to manipulate. Throughout the Day of Judgment crossover, Professor Palmer advises Ron in an effort to teach him chemistry concepts he's apparently forgotten after prolonged separation from Martin Stein. However, the role of sidekick becomes something of an insult to the Atom, whom DC introduced 17 years before Firestorm. Still, I guess they thought ol' Ray had nothing better to do than sit on a younger character's shoulder and recite chemical formulae. One of the Firestorms-that-almost-was, in a never-resolved cliffhanger. Art by Doug Mahnke. I'm told (although I haven't picked up the books in question) that Firestorm appeared during some issues of Grant Morrison's JLA as well as Geoff Johns' JSA, and that his appearances there built upon his relationship with Palmer, with writers even going so far as to have Ron enroll at the university where Palmer taught. Palmer accompanied him during the Green Lantern: Circle of Fire event, where they again ran into the Martin Stein elemental incarnation (who was, again, out in the furthest reaches of space, again losing touch with his humanity...anyone else sleepy?). Firestorm also started appearing in JLA during the "Obsidian Age" crossover, which I started but never finished picking up. Interestingly, this multipart storyline nearly paved the way for a new Firestorm regular series by the creative team of Mike Carey (of Lucifer fame) and Lewis LaRosa. That series would not only have reintroduced the "Firestorm Matrix," but given Ron not one but five "partners" with whom to merge, including a dead woman and a robot! 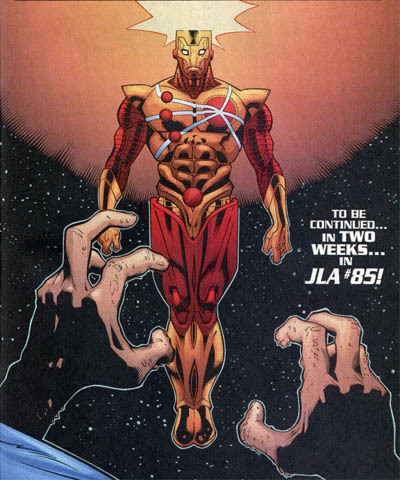 The series was planned so completely that JLA #84 featured a cliffhanger designed to lead into the new Firestorm #1, which was aborted by editorial (see above). I don't think I'd be the first to say, based on the initial concept I think Carey and LaRosa had a nugget of something interesting, but it seemed to really exploit the original Firestorm concept in ridiculous ways, more like a parody of the core concept instead of something genuinely growing out of the character's roots. True, it again used the idea of the Matrix, the first such mention since Martin left, but..."Team Firestorm"? Really? Urgh. Firestorm joins another failed team. At least the art (by Tom Grummett) is pretty. So where did the abandoning of another Firestorm series leave the character? Ironically, he fell into Kurt Busiek and Tom Grummett's newly-developed team book, The Power Company. 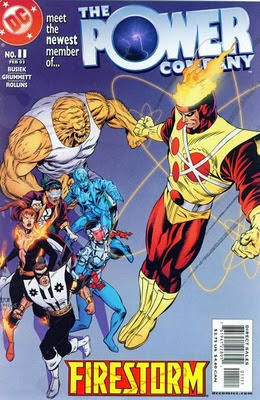 Brought on board to replace the then-ailing Josiah Power, Firestorm quickly found that he was not comfortable with the way the group operated, disagreeing with their de facto field leader, Manhunter (Kirk DePaul). Thankfully, Kurt Busiek gave the character back some of his respect, allowing him the ability to transmute inorganic matter and making him something of a voice of reason within the group as well as making him feel like the veteran he should be treated as in comparison with the other team members. His entrance, development, and exit from the group was exceptionally well-handled, and artist Tom Grummett drew an excellent version of the Nuclear Man (except he did seem to make Ron's face look far too old). After this entire period of experimentation during which his development often felt rudderless, what remained for the Ron Raymond iteration of Firestorm to do? One thing that DC proved beyond a reasonable doubt in the years since his title's cancellation was that they honestly didn't know what the hell to do with him. 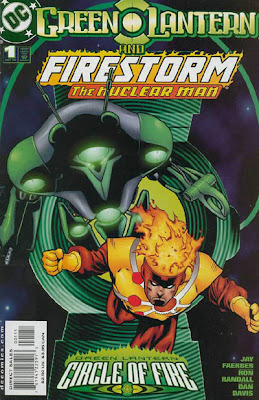 Nobody wanted to really touch the "elemental" version of Firestorm because of his insane power level and his having been developed from a character who was a senior citizen. Nobody wanted to really touch the "Firestorm Matrix" that John Ostrander had developed, probably because the concept seemed too complex to DC's writers--and when someone did have the sense to tackle it, they made the idea even more deliriously complex. And everyone who touched Ron Raymond as Firestorm seemed to want to make him something he wasn't--a model, a drunk, a newbie, a loser. So of course, somebody at DC editorial decided Firestorm had to die. Next: The Blistering Tale of the Firestorm of Earth-Eight!